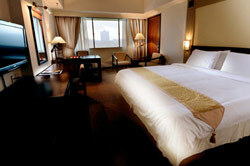 Located within 5 minutes from Kuching's central business district, the hotel offers the choice of two towers. The newly refurbished Tower A comprises 178 brand new rooms and suites while the existing Tower B offers 95 rooms and apartments, both offering the business and leisure travelers’ sheer comfort while visiting the capital city of Sarawak. Tower A is now fully opened. 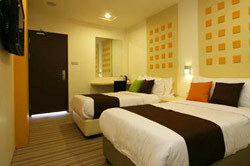 All the rooms are modern and chic with warm colors that exude luxury and comfort. Among the amenities in each room are 32" LCD flat screen television with 19 local and cable TV channels, wired broadband internet access, mini bar fridge, laptop size security safe, tea/coffee making facilities, iron and ironing boards and hair dryers. All guestrooms in Tower A now have got access to FREE wifi as well. Strategically located in the heart of Kuching's business entertainment, dining and shopping district, the Riverside Majestic Hotel is the ideal place for business, meetings and leisure. 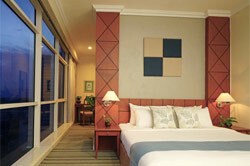 Overlooking the Sarawak River, the hotel commands a panoramic view of the city and the Kuching Waterfront. It is 20 minutes away from the Kuching International Airport and within walking distance of some of the city's major tourist attractions such as the Kuching Waterfront, Chinese Museum, Tua Pek Kong Chinese Temple, Fort Margherita and the Main Bazaar. 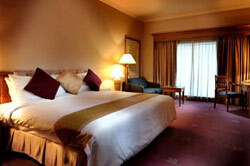 Grand Margherita Hotel, where you will be treated like royalty, is Sarawak's first international hotel. Situated along our backyard is the 1.7km stretch of scenic Kuching Waterfront where fitness enthusiasts enjoy their morning jogs and evening strolls. Exploring peaceful and relaxing Kuching along this trail will lead to tourists attractions nearby such as the Chinese Museum, Tua Pek Kong Chinese Temple, Fort Margherita and souvenir bargaining hot spot, the Main Bazaar. Alternatively, choose to jog at the nearby Reservoir Park or The Amphitheatre, and visit the Sarawak Museum along the way. A quick run along the perimeters of our hotel allows guests to feel the pulse of the city and offers a holiday photo opportunity with the famous Cat Family Statue. Spacious accommodation, friendly services and a city centre location complete with buzz and vibrancy are what guests of Ariva Gateway Kuching can expect. In the heart of the business centre of Sarawak, Ariva Gateway Kuching is an ideal accommodation choice for short business travel, extended project assignment or relocation. Chic, comfort-conscious interiors, avant-garde design, great city centre location, welcoming and friendly staff - an altogether perfect package at a perfect little price! From the moment you arrive at the entrance & enter the bright spacious lobby to the designer corridors, you get a sense that this budget hotel is different. However you can't avoid that nagging voice that asks may be you should have booked else where because you wonder for such a little price what the rooms look like? After check in, you proceed to your room. You touch your RFID key to the lock . It opens...you enter and the room is bathed in darkness. You insert the key card into the power slot and all the lights turn on.